If you are looking for a quick and super tasty meal to make in minutes on a Friday night, you have come to right place. 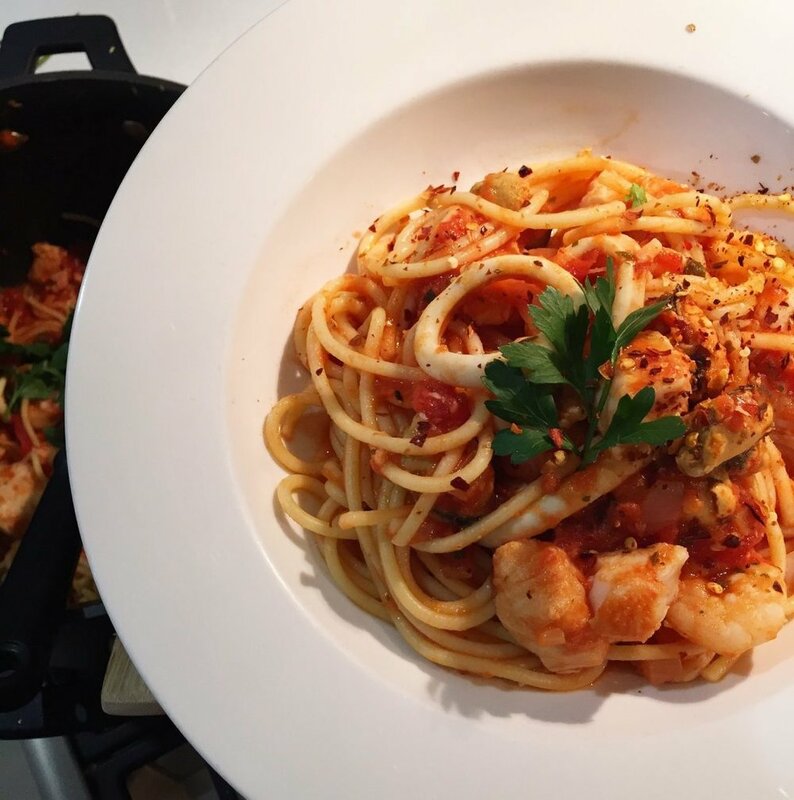 All you have to do is a grab a mix of fresh marinara from your local fish or supermarket deli. Mine was $9.50 per kilogram which made this meal $3.50 per serve. Yes, healthy eating doesn't need to be expensive when you are trying to prepare delicious and healthy meals for a family of 6. Drizzle olive oil, saute onions and garlic until transparent, add cup of white wine. Place pasta to boil and add tomato puree to onions and garlic. Once this delicious red sauce bubbles (which smells absolutely amazing!) add the marinara mix. Once seafood is cooked, add chopped parsley, salt and pepper. Drain pasta and serve in bowls, garnish with extra parsley, add chilli flakes (for those that like it hot) and shaved parmesan. It's heavenly and we all had a third serve! What are some quick and easy Friday night meals you like to prepare? Share them below as I would love to feature your recipe. Happy Friday and to keep updated with my weekly enews on fitness and food (and more news about my new 30 Days Fitness & Food ebook COMING SOON!) subscribe here and receive 3 free healthy foodie e-books.